Ah Korea, land of Sparkling. 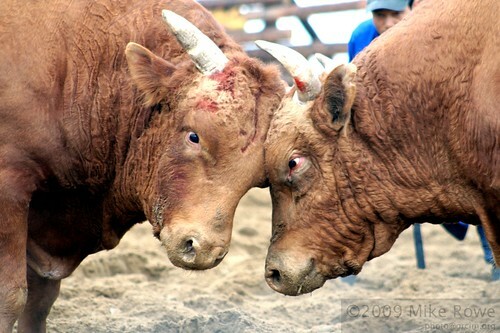 What could be more Korean than 2 bulls head-butting each other into submission? Stubbornness and a love of beef? That’s the Cheong-Do Cow Fighting Festival. 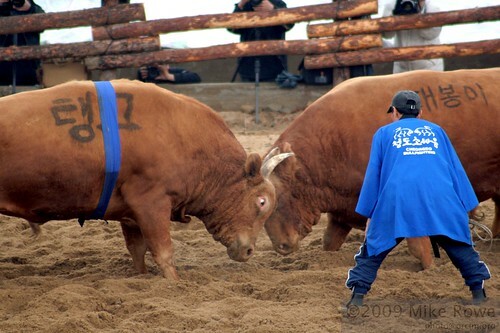 Korea vs Japan in a cow fighting festival. Simply put, they drag two bulls into a ring and try to motivate them to “fight”. The first one to turn and run is the looser. Some fights went on for a few minutes, some didn’t even start with one or both bulls refusing to fight. One of the more peculiar festivals I’ve visited in Korea, but certainly very entertaining.